This year Trolls was such an anticipated movie. With several well-known stars and a cast of colorful characters, it brought back the nostalgia from when I was a kid to the modern day era. I haven’t gotten to see it yet, but my kids both went with their grandparents and totally raved. I know that the Trolls movie isn’t available to purchase quite yet online, but you can bring some of the excitement home this Christmas with toys, apparel, and even bedding! 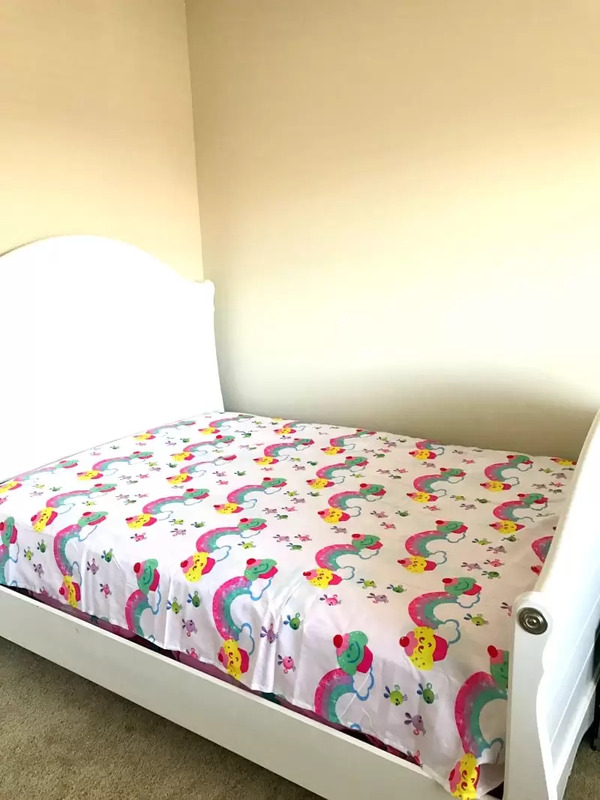 Recently we picked up Trolls Bedding from Walmart and I have to tell you, I was totally caught off guard on how incredibly bright and cute it is. I fully expected the comforter to be adorable, but I didn’t expect the contrast of the sheets, reversible pillow cases, and even reversible comforter. We also added a large headboard pillow and a Troll holding a blanket, both affordable and perfect to complete the look. I know this is kid bedding, but it brings out the kid in me too! Check out our top 4 picks to Trollafy your room! Plus do not forget to watch above and enter the contest, where $2250 in e-gift cards and 75 winners will be chosen, each winning a $30 Walmart e-gift card. 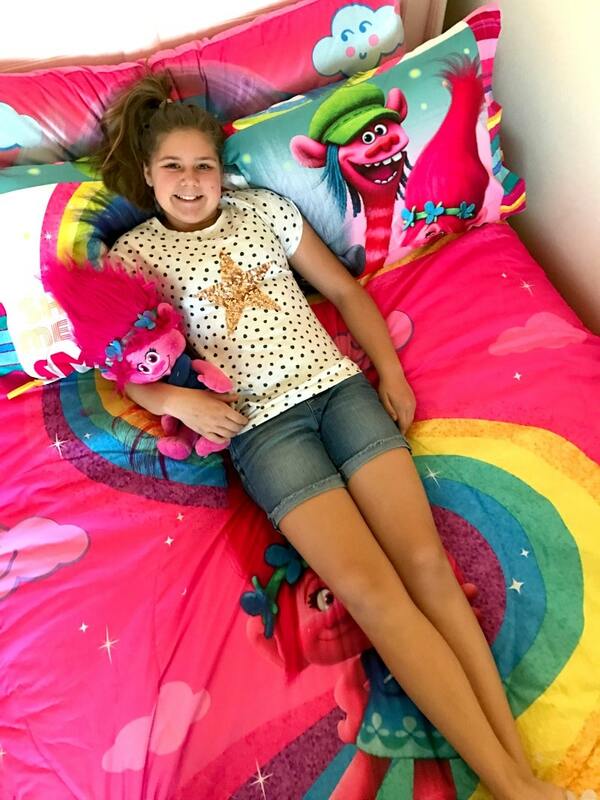 (Dreamwork’s Trolls “Show Me a Smile” Poppy Reversible Twin/Full Bedding Comforter) Change up the look of your child’s bedroom with this Dreamwork’s Trolls “Show Me a Smile” Twin/Full Bedding Comforter. It features colorful graphics of Princess Poppy dancing in a bed of flowers on one side and Poppy with her friends Branch, Guy Diamond and Copper on the other side. This twin bedding comforter is made of 100 percent polyester with 100 percent polyester fill for enhanced comfort. The reversible design lets you create several different looks instantly. The vibrant colors bring a cheerful feeling to the room while the bedding keeps her warm all season. 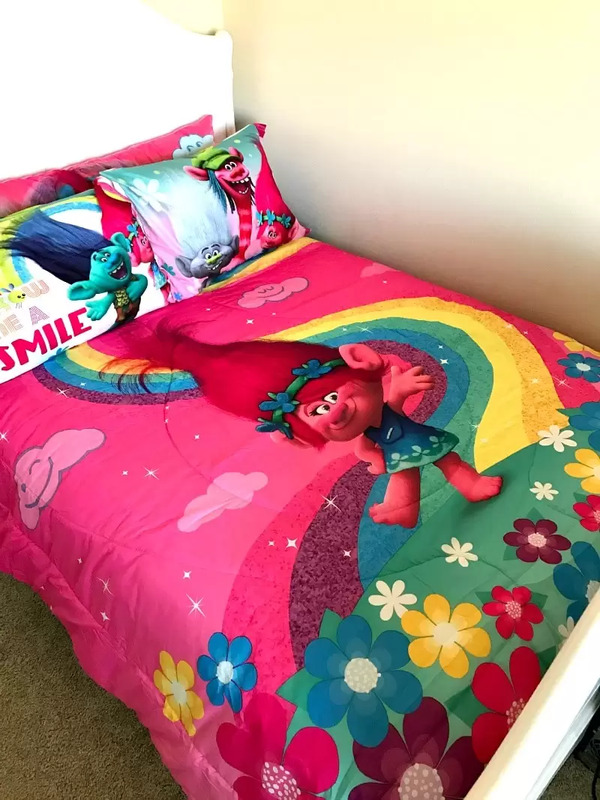 Pair this adorable Dreamwork’s Trolls “Show Me a Smile” Twin/Full Bedding Comforter with the matching sheets, blanket, curtains and the Poppy cuddle pillow (sold separately) to give your child a complete Trolls theme environment. It’s machine washable for easy care. Your little one will be off to bed and dreaming about their next adventure with Trolls ‘Show Me a Smile’ Sheets. Sheets are available in both twin and full size and are the perfect compliment to the Twin/Full Comforter. Sheet Set includes 1 flat sheet, 1 fitted sheet and reversible pillowcase(s). 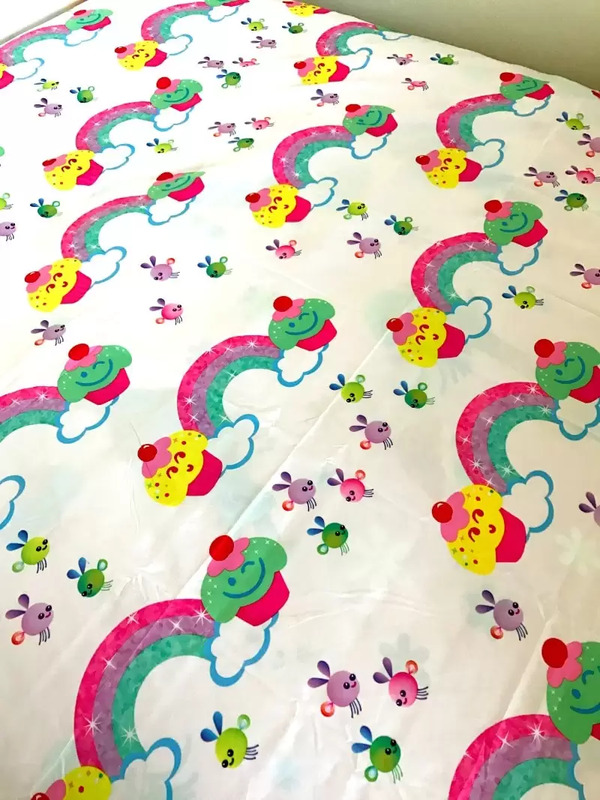 They are 100 percent polyester and machine washable for easy care and maintenance. Pair the sheet set with the Twin/Full Comforter, blanket and Poppy Cuddle Pillow to give you little one the complete Trolls collection. Makes a great gift! 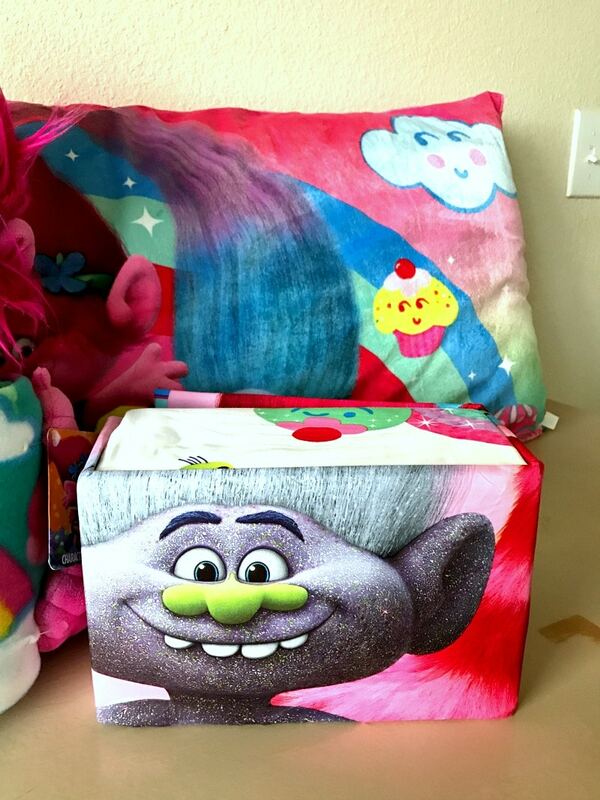 DreamWorks Trolls Princess Poppy cuddle pillow is a must have! Poppy the optimistic leader of the Trolls is always ready for her next adventure. Cuddle up with Poppy at bedtime or nap time. Perfect for taking along on family road trips, sleepovers or even a car ride to the market— she does love her adventures. Cuddle Pillow is 100 percent polyester (exclusive of decoration) making it easy to clean. Perfect for cuddling up with on the couch to watch your favorite movie or TV. Pair Poppy cuddle pillow with the comforter, sheet set and throw to give your little one the perfect Trolls bedroom. Dreamwork’s Trolls “Cupcake Garden” Body Pillow : If you have a Trolls fan then this ‘Cupcake Garden’ Body Pillow is a sure way to bring a smile to their face. It features center stage Poppy, the optimistic leader of the Trolls surround by her friends and yummy cupcakes. Body pillow is the perfect accessory for lounging around the house. The body pillow is made of 100 percent polyester and is easy to clean making it a great companion on family road trips or sleep overs. Can also be paired with the reversible twin/full comforter, sheets, drapes and cuddle pillow to complete your Trolls collection. Makes a great gift. How do I get Trolls Bedding? Walmart has tons of it, as well as other Trolls products like clothing, games, and toys! You can see everything you need for your Trolls fanatic (young or old) at a low cost right here.